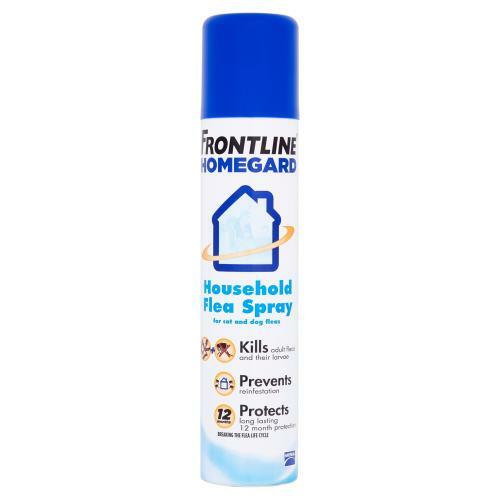 FRONTLINE Home Guard Spray is a household flea spray from the manufacturers of Frontline Spot On, the UK’s No.1 flea and tick protection. It eliminates adult fleas on contact and prevents eggs and larvae developing in your home for approximately 12 months, providing enhanced year-round protection against re-infestation. As an aerosol spray, it’s simple to use on carpets, cracks and crevices in flooring, animal beddings and soft upholstered furniture to eradicate fleas and prevent re-infestation. It is the ideal complement to the regular use of Frontline Spot on to provide the most effective and integrated approach to flea control. Do not apply directly to animals, it’s use is for the home and surrounding environments.